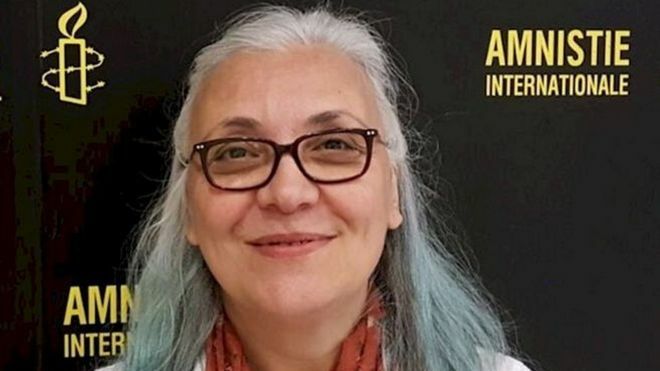 Turkish police have arrested eight leading human rights activists including Amnesty International's Turkey director Idil Eser in Istanbul. Two trainers - from Germany and Sweden - were also arrested in the raid on a digital security workshop run by Amnesty at a hotel in Buyukada. The police raid was "blatantly without cause", an Amnesty statement said. The group's whereabouts are unknown. Police have jailed more than 50,000 people since a coup plot a year ago. The police action "is a grotesque abuse of power and highlights the precarious situation facing human rights activists in the country", said Salil Shetty, Amnesty International's Secretary General. "Idil Eser and those detained with her must be immediately and unconditionally released."